Haddon Meat Market and Penn Jersey Seafood, which have continued to operate during bankruptcy proceedings at the site, are being shown the door in a planned deal with DuBell Lumber. Fadi Ghobrial, owner of the Haddon Meat Market. Credit: Matt Skoufalos. Four years ago, the Haddon Farmers Market promised an opportunity for Camden City residents and their suburban neighbors to buy fresh food in a location convenient to their homes. But last year, as reported in the Courier-Post, the property at 2820 Mt. Ephraim Avenue prepared to shut its doors for good amid bankruptcy filings. Today, just two businesses remain within its 55,000-square-foot shell: the Haddon Meat Market and Penn Jersey Seafood. Now, with a deal looming to demolish the works, DuBell Lumber is looking to build a new headquarters on the site, and the existing tenants have 30 days to vacate. That means a loss of local jobs, access to groceries, and a crippling blow to a pair of viable businesses that are asking for enough time to relocate up the road. 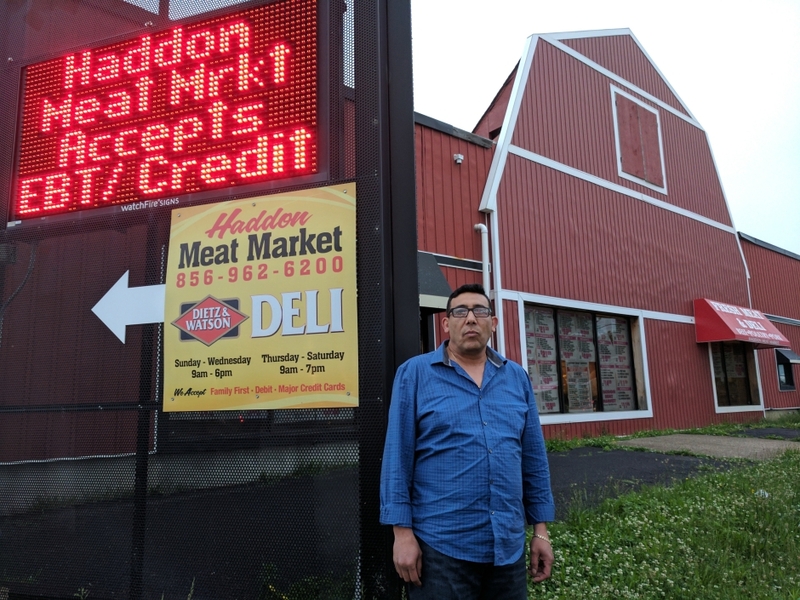 Haddon Meat Market owner Fadi Ghobrial said he doesn’t object to the shutdown, just the way it was handled. Ghobrial was aware of the foreclosure bankruptcy proceedings, and saw many of his fellow tenants evicted when they were first announced in 2014. But he said his landlords told him “You guys are okay,” and even invited him to expand into the extra space within the building. They increased his rent and asked him to take on the added responsibilities of managing the bathrooms, parking lot, and onsite food court. 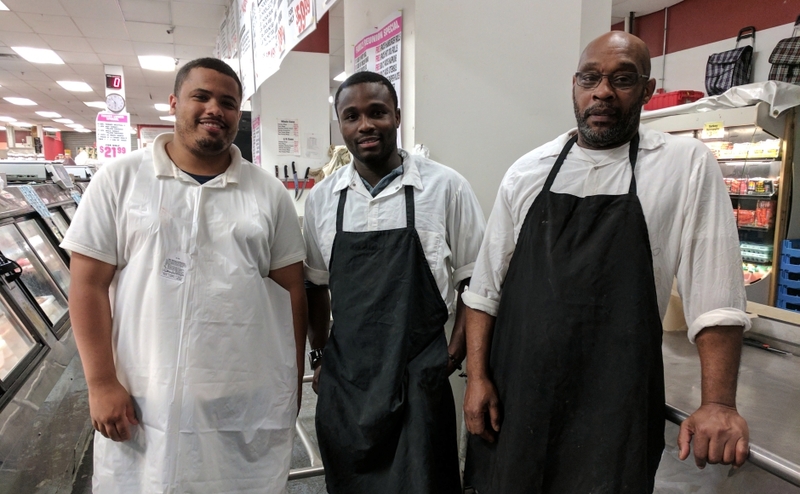 The Haddon Meat Market can be moved up the block, but its owner said he needs time to do it. Credit: Matt Skoufalos. Ghobrial grew his business accordingly, adding more inventory, equipment, and staff to fill out the space. His lease isn’t up until August 2018, but once the bankruptcy deal was approved, Ghobrial’s landlords invoked a termination clause. Now he’s facing the reality of having to liquidate those additional assets. Ghobrial said he’s negotiating terms on a new location at 1715 Mt. Ephraim Avenue, but will need at least another six months to fit out the space. He’s asked his landlords to honor the lease agreement so he can move without laying off staff, but said they’ve cut off communications with his attorney. Geralena Miller said she’s worked for Ghobrial since 2014 and will be out of work if the shop closes. Credit: Matt Skoufalos. 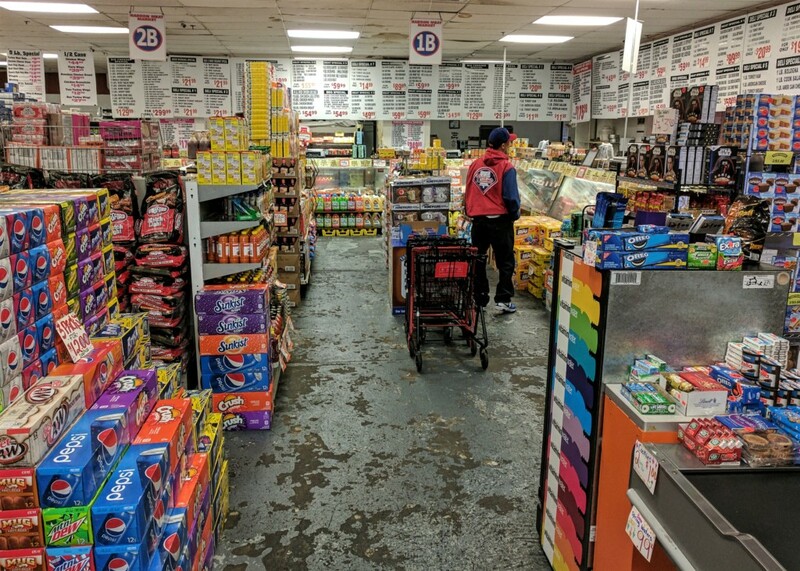 Ghobrial’s main customer base is composed of locals; he said some come from Philadelphia, Atlantic City, or Willingboro, but most are from places like Camden, Pennsauken, and Laurel Springs. “Our prices are very convenient for them, and we always have fresh products,” he said. 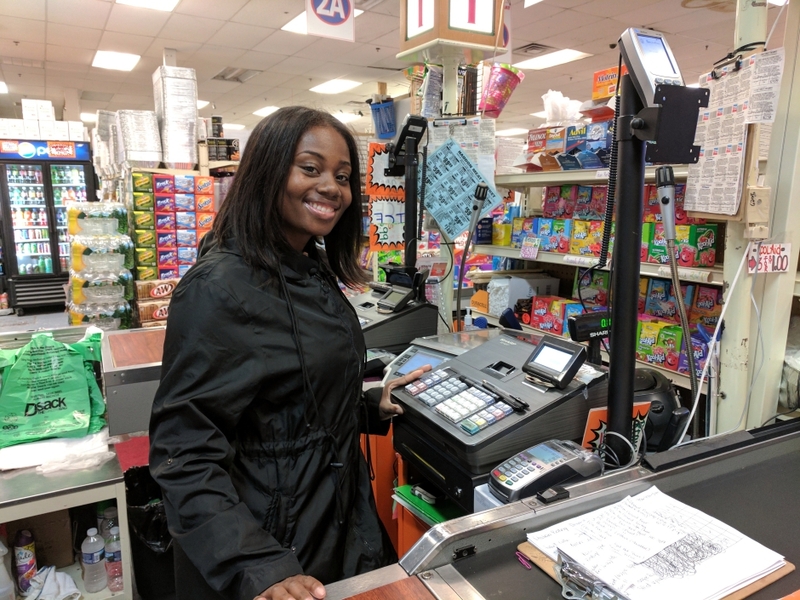 Geralena Miller of Philadelphia has been working at the Haddon Meat Market since July 2014. She says the atmosphere is great, her coworkers are friendly, and she’s on a first-name basis with a lot of the customers. Miller relies on the income to support her family, which includes her 3-year-old son, Ryan, and fiancée, Robert. 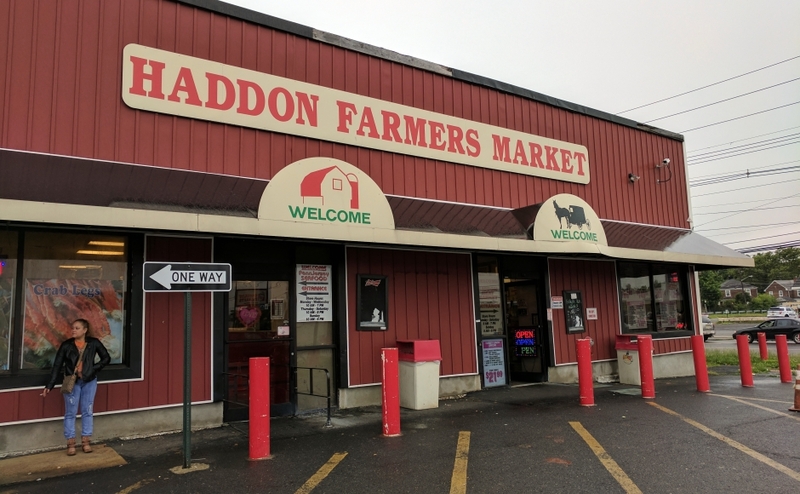 So do Miller’s customers, some 3,000 of whom have signed petitions asking that Haddon Meat Market be allowed to keep its lights on at least a little while longer. Many rely on its proximity to public transit—there’s a bus stop right out front—and the surrounding neighborhoods. “It’s accessible,” Miller said. “A lot of our customers may not have transportation. A lot of people ask us to please stay in the neighborhood if [we]have to relocate. 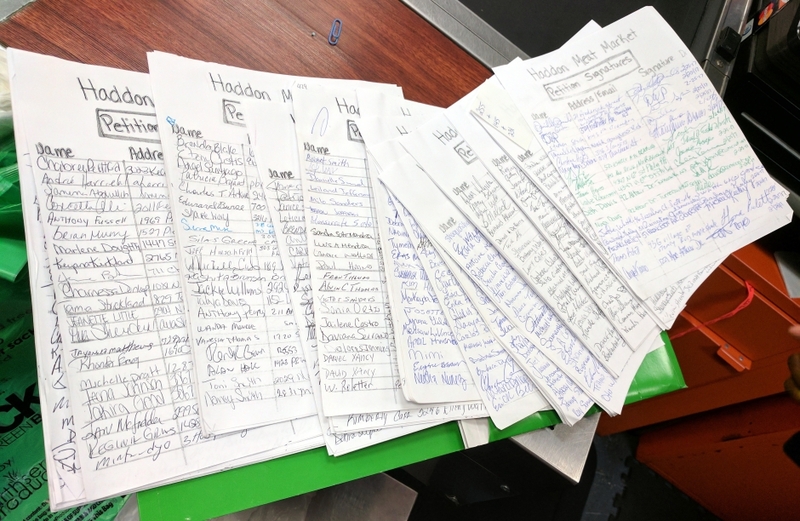 Signatures of Haddon Meat Market customers petitioning for the shop to stay open. Credit: Matt Skoufalos. “I’ve been doing this for a long time,” she said. “If we are able to stay here, we will continue to provide great customer service, good quality meats, deli, and groceries. “We will still be customer-focused, and dedicated to helping our community,” Miller said. Sony Delos Santos of Mt. Ephraim is a recent hire; he doesn’t know what he’ll do without the job. Neither does Percy Moore of Fairview, who’s worked at the market for two years. Nicholas Nesta Bal of Philadelphia is in the same boat, as are another eight of the shop’s employees. Camden City spokesman Vince Basara, who coordinates its Urban Enterprise Zone (UEZ) program, said the community is “obviously sensitive” to job creation and employment issues. He said the local government would like to retain the businesses and their employees, and typically works to help entrepreneurs in similar situations to identify an interim location for their operations. From left: Sony Delos Santos, Percy Moore, and Nicholas Nesta Bal will all be out of a job if the market closes. Credit: Matt Skoufalos. “Unfortunately, this type of thing does happen,” Basara said. “DuBell is also a local employer, and that’s a significant economic development project for the city,” Basara said. The EDA has approved $18.3 million in tax incentives for DuBell, and that’s after the Haddon Farmers Market was already a beneficiary of $1.25 million in EDA incentives in 2012, back when it was valued at $6 million. In citing its decision to justify those incentives, the EDA application notes that the property at 2820 Mt. Ephraim Avenue is located in a “deep poverty pocket” as well as within a mile of the nearest PATCO station, offering additional bonuses for each. The project is expected to add 30 new jobs and retain 92 others that could otherwise be shipped out-of-state. Spokespersons for Markeim Chalmers of Cherry Hill, which has been granted receivership of the property, did not respond to a request for comment.